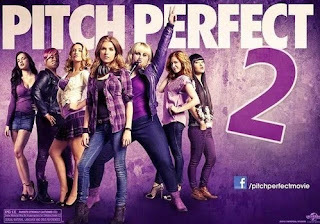 I wasn't super excited by the original PITCH PERFECT movie but that film at least had novelty and some great songs. This sequel lacks novelty and great songs, and I didn't laugh once. Even Elizbeath Banks & John Michael Higgins' snarky competition commentators didn't make me laugh. The irony is that the very story of the film is of a successful group that has lost its mojo, not sure of what it wants to be, misfiring and alienating its audience. After an early mishap, the Bella's acapella group find themselves banned from defending their national championship title unless they can do the unthinkable and win the world championships. However, the group is intimidated by a crypto-fascist German group called Das Sound Machine and inwardly fretting over what will happen to them when they graduate. The mash-up queen, Becca (Anna Kendrick) is secretly interning at a production studio where the boss (Keegan-Michael Key) tells her she has to make something original. And young Emily (Hailee Steinfeld) just wants to write songs, breaking the cardinal rule of Acapella that you only do covers. What's wrong with this film? It isn't funny. Rebel Wilson is occasionally funny and the only stand out moment is when she serenades Adam DeVine's Bumper. But for the most part, it's a total drag. Second, the songs aren't good. Deliberately so for the most part, because the Bella's have "lost their sound" but even so, part of the reason why people go to see a film like this is to hear good music. Even when the girls get their "sound" back, the songs aren't memorable. When Becca inevitably mixes an awesome track to impress her boss, it should impress us too. All of which is a bit surprising considering that the wonderful Mark Mothersbaugh did the soundtrack. And as for Elizabeth Bank's first directorial effort - well, there's no directorial flair to see here. PITCH PERFECT 2 has a running time of 115 minutes and is rated PG-13. The movie is on release in Australia, New Zealand, the Philippines, Sweden, Austria, Germany, Malaysia, Netherlands, Russia, Singapore, Thailand, Canada, the Czech Republic, Finland, the UK, Ireland, India, Iceland, Pakistan, Poland, Slovakia, the USA and Vietnam. It opens on May 19th in Cambodia; on May 21st in Colombia, Hungary, Italy, Mexico, Portugal and Serbia; on May 22nd in Spain and Norway; on May 28th in South Korea; on May 29th in Bulgaria, Estonia, Lithuania, Latvia, Morocco and Romania; on June 4th in Israel; on June 9th in Bahrain; on June 11th in Brazil; on June 25th in Chile; on July 22nd in France; on July 29th in Belgium; and on August 6th in Argentina and Denmark.